The Three Forks trail is located in the White River National Forest north of Rifle, Colorado. The trail begins at the lower trailhead off of Forest Road 832 and follows a scenic forested canyon as it makes a gradual climb to the upper trailhead on the Flat Tops at Road 211, the Bar HL Road. Several side canyons, or gulches, connect with the Three Forks trail providing more options for other excursions. 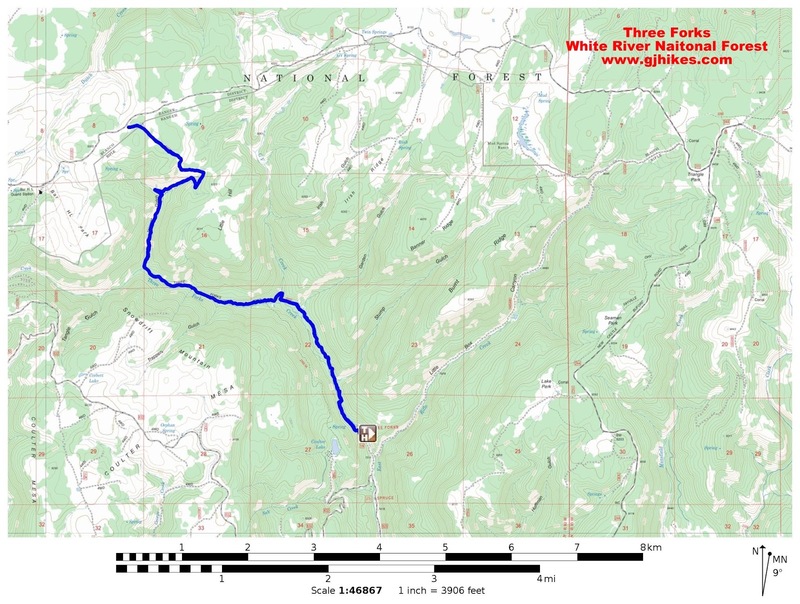 The Three Forks trail lies completely within the White River National Forest which doesn't require a fee to be paid unless at one of its campgrounds. The road to the trailhead passes through the Rifle Mountain Park which is operated by the City of Rifle and it has a fee of $5/vehicle. If you don't plan on making any stops while driving through the Mountain Park then you aren't obligated to pay the fee. Be warned though, the drive through the Rifle Mountain Park is one of the most beautiful drives you will find anywhere and you may not be able to resist lingering around to enjoy it a little more. To get to the trailhead drive north out of Rifle on Highway 13 and turn right onto County Road 325 after about 2 miles. Follow CR 325 for a little over 11 miles passing Rifle Gap and Rifle Falls State Parks. The pavement ends at the fish hatchery and the road becomes CR 217. 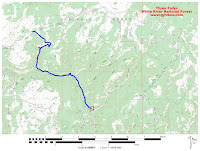 Follow CR 217 through the Rifle Mountain Park for about 4.8 miles to the White River National Forest Boundary. Stay to the right as you pass the turnoff to the Coulter Guest Ranch and turn left at the sign for the Three Forks trailhead which is only about 2 more tenths of a mile. The trail begins with a bit of a slope but soon becomes much gradualler for the next mile or two. Be sure and cross the footbridge over the creek when you come to it and stay to the right on the higher branch of the trail. It is much easier than the trail that is closer to the creek. Of course, if you want to give fishing the beaver ponds a try then you will want the lower trail. Wooden posts with mile markers inscribed give a general idea of how far you have hiked. Our GPS readings showed some discrepancy with the distances but they are still valuable pointers and a very nice addition to the trail. When so many trails don't even have trailhead markers it is nice to come across one like this. We have over 1,000 trails on our todo list and we keep coming across more hikes like this one in Garden Gulch that looks worthy of adding to the mix. There are several stream crossings to make on the Three Forks trail. On this trip they could all be made without getting your feet wet. Since that isn't always the case it is nice to have a good pair of waterproof boots. I am currently wearing a pair of Salomon Men's Quest 4D GTX Backpacking boots that I absolutely love. They are very comfortable and feel like a fortress around my feet. And in case you are wondering this isn't a paid endorsement and I had to pay full price for the boots just like everyone else. As the trail progresses up the valley there are places where the grass and wildflowers become about waist high and obscure the trail a bit. For that reason long pants might be more preferable than shorts. It isn't the sort of brush that scratches your legs up so decide for yourself what you prefer. Right around the 3 mile point the trail turns sharply to the right into Hoover Gulch. Eventually the trail is going to leady you up to the top of the mountain in this picture. The route it follows keeps the rate of ascent about as gradual as it is at this point. It will make one short switchback and then several very long ones that lead into a side canyon on the right where the trail has been rerouted so that the climb can continue to the top at the same moderate slope. Once on top the trail levels off for the last 3/4 of a mile for a very pleasant stroll that alternates between aspen groves and open meadows. The upper trailhead at Road 211, the Bar HL Road, now has a nice new sign and kiosk. This spot is a little west of the old trailhead that was unmarked. This picture was taken on the hike back at a spot overlooking Hoover Gulch. From here you can see how the Flat Tops area got its name. All of the mountains are pretty much flat on top. Everything was all bright and sunny until we got to the last half mile of the hike when a thunderstorm came rolling in over the mountain and the deluge began. There weren't any tenderfoots on this hike though so we simply put our raincoats on and kept hiking. For the most part the Three Forks trail is an easy hike. The rocky sections are short and few. Even though the Three Forks trail was 11.5 miles round trip with an elevation gain of 1,700 feet it seemed like only a moderate hike. Some of that might be due to the fact that it is in such a pleasant setting. If you would like to see it for yourself then all you have to do is 'Take a hike'.